Pure. Raw. Tasteless. Naturally Liquid. Successfully used by	NASA as a supplement for astronauts. Most nutrient-dense source of minerals on the planet. Our Spirulina is 100% pure, raw, and fresh. It's never been processed or dehydrated. We do not separate from our Spirulina its most potent ingredients such as Phycocyanin or Zeaxanthin. For many reasons. Including why you'd prefer fresh blueberries over powdered ones. 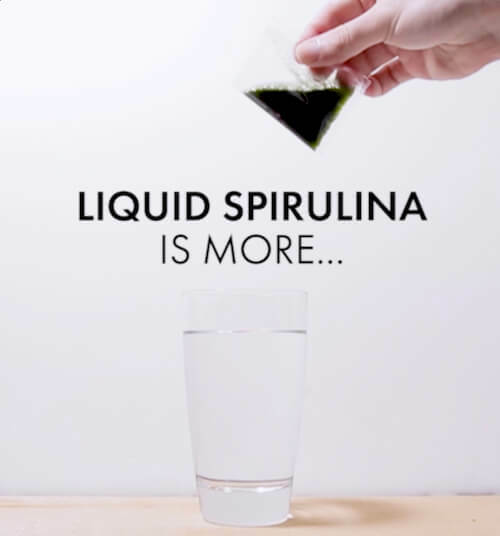 In Canada, Spirulina is largely consumed in a powder or tablet form, and many are unaware that the drying process degrades the vitamins, minerals and proteins leaving a final product that's depleted of its vitality. Vitamins and minerals that are hard to absorb from other sources are abundant and bio-available in Liquid Spirulina. Our product is 100% fresh, liquid, raw Spirulina from Canada and its never been in powdered form. Fresh Spirulina is a natural remedy for oxidative damage and a fantastic source of antioxidants. Oxidative damage can harm your DNA and cells. This damage can drive chronic inflammation, which contributes to chronic pain and other diseases. Fresh Spirulina contain’s nature’s only source of Phycocyanin, which is a powerful antioxidant that can prevent or slow damage to cells caused by free radicals, unstable molecules that the body produces as a reaction to environmental and other pressures. Spirulina has been known to aid in weight loss because tt is a highly bioavailable source of nutrients and vitamins. And has low calories. It also contains powerful amino acids that help suppress hunger cravings. It also curbs the appetite which which reduces hunger cravings. Spirulina contains vitamin E, selenium and tyrosine, which are all known for their powerful anti-aging effects. The antioxidants present in tyrosine eliminate free radicals and slow down the aging of skin cells. Spirulina is also a wonderful source of chlorophyll, which has cleansing properties, and it also helps your skin retain moisture, which is a major key to maintaining the appearance of smoother, hydrated skin. Fresh Liquid Spirulina contains amino acids that provide live prebiotic enzymes. Prebiotics help probiotics grow and remain in your digestive system. These live enzymes help facilitate healthy digestion and also helps fight intestinal infections as it has immune cells, which fight off virus and thus promote digestion. Fresh Liquid Spirulina retains its zeaxanthin content which helps strengthen vision. It also contains 10x more beta-carotene to than carrots which is essential for healthy eyesight and Vitamin A. Vitamin A protects the cornea from blurry vision, eye pain and swelling. As a complete protein, Spirulina contains all the essential amino acids that are required for protein assimilation in the body. It does this by by having a rich content of all the vitamins in the B Group. And the Omega-6 content in Spirulina is an essential nutrient that is easily absorbed by the body helping release energy and improve brain function.